Sav finished up his tour yesterday with a very happy group, and a tour total of 155 species. The last few days have been excellent, with a great Stewart Island pelagic – 18 species of tubenosed seabirds! Unfortunately no mottled petrels or broad-billed prions on the day, but at least 10 grey-backed storm-petrels (with up to 6 in one binocular view) has to be an exceptional record! Add to that white-faced storm-petrel and a Wilson’s storm-petrel, three Fiordland crested penguins and a Snares crested penguin and you have a pretty great day on the water! Next day was leaving Stewart Island and heading north, with a struggle to find yellow-eyed penguins. In the end perseverance and knowledge of where to look paid off, and the group had great views of a couple of juveniles and an adult fresh out of the water for quite some time. Next day saw excellent views of black stilt in a number of locations, and probably about 6 or so individuals, so happy with that! Also great views of Baillon’s crake. Following morning had sightings of chukar, rounding the trip list to 155 species. A surprising miss for the group being shining cuckoo, which can be a little hit and miss this time of the year, but often seen somewhere along the way. So a happy group of birders heading home after a great tour with Sav! Phil and his group are going really well, with a great morning off Kaikoura with Gazza and Albatross Encounter. Five species of albatross including Northern Royal, and also several Southern giant petrels, not always easy during the summer months around New Zealand. In the afternoon they managed to find a cirl bunting and have some time off, and great little owl sightings that evening. Next day Phil also found the black stilt at the Ashley Rivermouth, along with their first black-fronted terns. Then later in the day kea near Arthur’s Pass and heard three great-spotted kiwi calling that night, one quite close! Next day down the West Coast and the group had excellent views of Okarito brown kiwi that night! Always a great time out with Okarito Kiwi Tours, and tonight no exception with three good views. Next day on towards Wanaka in the sunshine, with some forest and coastal stops along the way. Glimpses of yellowhead, but great brown creeper (Pipipi), rifleman and tomtit, so all happy. A big day the next day with the drive in to Milford Sound. Excellent rock wren within a few minutes of arriving at the location, and managed to watch a pair for about 10 minutes, feeding, bobbing on rocks, etc. sometimes down to about 2m away! Amazing! Forest stops had more rifleman and super close South Island robins. Matt and his group also continue to have a great time, with an excellent 24 hours on Tiritiri Matangi Island. They had 8 takahe, including three large chicks, and an amazing encounter with three kokako. They also saw three morepork – two in a daytime roost – and several spotless crakes, as well as all the other usual subjects around the island – North Island robin, North Island saddleback, stitchbird, fernbirds, etc. That night two tuatara and two little spotted kiwi finished off a pretty amazing day on the island. Next morning they left the island and headed to Miranda, with 100s of wrybill now gathering following their breeding in the South Island. A large flock of 56 Pacific golden plover, a curlew sandpiper, red-necked stint, and two sharp-tailed sandpipers also seen, and then the broad-billed sandpiper was found as well! Next morning pre-breakfast had the same sort of assembly as the above, and then an afternoon pelagic out of Whitianga. They had sloppy conditions offshore, but got most of the expected seabirds, although Pycroft’s petrels were missing until right till the end when they got great views! They also had a large mako shark around the boat and a small pod of short-beaked common dolphins on the way in at the end of the day. Next day a glossy ibis and some cattle egret to boost the tally, and some more shorebirds (including a Hudsonian godwit) before heading to Pureora Forest Park for some forest birds. Fantastic views of yellow-crowned parakeet, and then a harrier being ‘seen off’ by a large aggressive female falcon! Excellent! Later in the afternoon a slow flyover long-tailed cuckoo was good, as was a male falcon being chased by tui! Next morning Matt and his group were up early and found three blue duck near Turangi, and another falcon being chased by tui! No bittern despite searching, but did find New Zealand pipit, California quail (been hard to spot), and a shining cuckoo! On through to Hawkes Bay with a nice forest stop for North Island tomtit, and then the long-staying plumed whistling duck in Taradale, with a black-fronted dotterel on nearby wetlands. 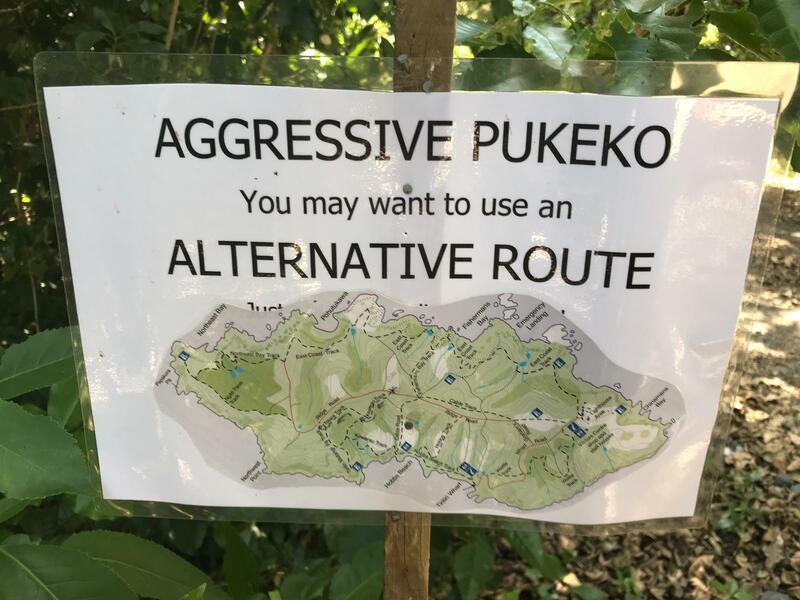 A sign found by Matt and his group on Tiritiri Matangi Island – not something to be messed with I would say! So some excellent sightings and everyone happy! More soon!